Yours in Aiki, Christian Taschner. Reviewer: Stanley Pranin. 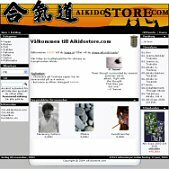 Aikido Journal. We recently received copies of the two volumes of this new book series on the Aiki Ken and Aiki Jo by Ethan Weisgard of Denmark. They are lovely hard-bound books with all color technical photos. Very well done and recommended! “A very fine books series, with the entire Aiki Ken and Aiki Jo repertoire included. The books are carefully bound and very exclusive in their appearance. They will last through many hours of study either at home or in the dojo. The forewords are written by Paolo Corallini and Ulf Evenås, the two 7th Dan top representatives of Morihiro Saito Sensei.